Seventy or so years ago, Pierre Schaeffer and others experimented with composition based directly on sound rather than on notated pre-compositional structures. Using the then-new technology of magnetic tape, they laid the foundation for a tradition of concrete, acousmatic music. Polish composer Dariusz Mazurowski continues that tradition with neo-acousmatic music that carries some of the outward marks of classic postwar experiments with sound composition. Mazurowski (1966) was born in Gdansk, Poland. He began composing in the 1980s and after moving to Prague in the 1990s he returned to Gdansk, where he currently lives and works. What makes his acousmatic work “neo” isn’t the sound so much as the methods behind the sounds. Rather than relying on the manipulation of tape or other mechanical means of sound registration and reproduction, his work takes advantage of more recent analogue and digital technologies to sculpt works combining electronically-generated sounds with sampled sounds of acoustic and electronic origin. 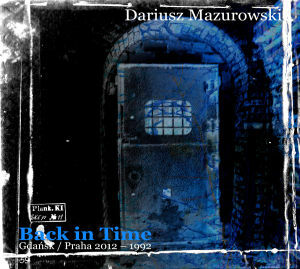 Back in Time, a set of ten electroacoustic pieces released last year, surveys Mazurowski’s work for the period 1992-2012. Much of it is sound montage in which the sources are more or less transparent, even when chopped up and mixed together. Mazurowski juxtaposes fragments of speech, shards of recorded music, vintage recordings, electronic tones and stuttering turntables into a kind of mosaic or quick-cutting non-linear narrative. Individual sound elements appear as discrete entities—the audio equivalent of the hard-edged, geometric shapes in a Suprematist painting that collide and occasionally overlap but never lose their distinctive profiles. Mazurowski’s Non Acoustic Symphony, recorded between 2011 and 2013, is a seven part work for electronics and electronically-altered sounds. In contrast to Back in Time, the Non Acoustic Symphony tends to obscure its sound sources, leaving a residue of sonic qualities that in many cases can’t be traced to their origins. Most may be purely electronic, but some clearly are sampled. From time to time hints of acoustic instruments can be detected, if speculatively: Here could be a note struck on a piano, there possibly a gut string instrument being plucked. Through it all Mazurowski makes generous use of sound manipulation by way of analogue, digital and granular processing. What both Back in Time and the Non Acoustic Symphony share is a strong sense of linear continuity. Sound objects give way to one another in sequence and with a minimum of vertical organization. Mazurowski’s emphasis on a predominantly horizontal layout makes for a clarity of “orchestration” as individual sounds, functioning as the equivalent of instrumental choirs, come through as distinct, sharply defined objects. This orientation helps to maintain forward motion in the absence of pitch relationships or harmonic implication. As with any successful acousmatic music, neo or otherwise, this is music of character—a character directly derived from the qualities of the raw materials it contains. 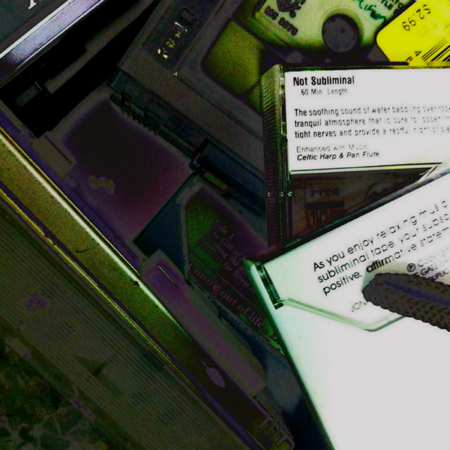 C. Reider’s Not Subliminal, a collection of five mostly real-time improvisations for multiple cassette decks, is an essay in post-acousmatic sound art carrying echoes of an age of mechanical reproduction past. Reider’s sound sources are cast-off audio tapes he found in thrift stores as well as a video tape cut down to play on an audio cassette deck. One or more tapes were run and manipulated while a separate deck recorded the resulting sounds, in addition to any ambient sounds present. Underneath the hissing of tape and the humming of the decks’ playback machinery some of the sounds of this audio salon des refusés jump out and identify themselves: Various talking heads, bits of now-unpopular pop music, scrambled fragments of a theatrically delivered monologue on Scientology. As with much of Reider’s work process is brought to the foreground, in this case as embodied in the sounds of the machines constructing the work—the squeal of spindles turning, the general rattle and buzz of moving parts. The artist’s hand is also audible, snapping cartridges onto sponsons, pressing buttons, picking up the next tape to go into the deck. In the end what isn’t subliminal here are the immediate, explicitly indicated sonic traces of the conditions and means of these improvisations’ production. Peter Batchelor’s Kaleidoscope is an acousmatic work meant to model in sound the kinds of dynamic patterns visible through a kaleidoscope. The five pieces that make up the work were composed for a listening environment situated in the middle of eight speakers arranged in a circle; listening to the recording can only approximate the spatial effects obtainable in such a setting, and to that extent is something like listening to a reduction for piano of an orchestral work. Still, there’s much to like when these pieces are listened to just for the way they organize sound. For the first four tracks, Batchelor arranges digital samples to trace the trajectory of things breaking apart, the pieces diverging and converging again. Drawing on a variety of sound sources, including field recordings of natural and artificial phenomena, and using looping, repetition, and granular manipulation, Batchelor juxtaposes similar and contrasting sound colors of varying intensities, density and dynamics to achieve his aim. Though the identity of the sound sources is for the most part obscured by manipulation—this is acousmatic music, after all—sometimes, as in Fuse’s recognizable samples of rainfall, they reveal themselves. The final piece, an aural portrait of a gaming arcade, evokes its subject through chirps, beeps and buzzes that will elicit memories in anyone who’s ever played a game of Space Invaders in a public space. Kaleidoscope comes as a two-disc set. A DVD-ROM contains the work in its full, original eight channel format, while a stereo CD is included as well.